I don’t know about you, but I can’t believe that Christmas is only two weeks away. It feels like we were just getting ready for Halloween and now 2018 is just around the corner. 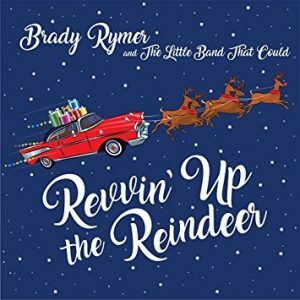 So, with the holiday season quickly approaching, the final children’s album that I would like to shine a spotlight on is Revvin’ Up the Reindeer from Brady Rymer and The Little Band That Could. This collection of 13 all original songs is a joy to listen to from beginning to end. The amazing musicianship of Rymer and the band is evident in every song as they bring a rock feel to songs such as “Revvin’ Up the Reindeer” and “Hanukkah Rocks,” a little bit of Americana to “Trim the Tree,” and an almost old school country/western vibe to “Peace Be to All.” Delightfully, the lyrics are as well written as the music with “Christmas Peace” retelling the Christian story of Christmas, “Rainbow Candle” capturing the quieter moments of Hanukkah, and “Baby New Year” introducing listeners to that pudgy little baby who wears a top hat, diaper, and a sash. While this album wouldn’t work in most school or library program settings, it is a must have for all libraries that have circulating holiday music collections. This new set of holiday songs are tunes that families can enjoy listening to together and parents won’t mind visiting again and again. For a little taste of what to expect, check out the video below or visit Brady Rymer and the Little Band That Could on YouTube to see additional videos from the album. It’s hard to believe that we’ve already reached the time of year when the stores put all of the Thanksgiving items on clearance, the pre-Black Friday sales begin, and local radio stations start playing Christmas music. And all of that before the family has even arrived to enjoy the abundance of deliciousness known as Thanksgiving dinner. So, since all signs point to it being “that time of year,” over the next month I’ll be highlighting several new family albums that celebrate the holidays. First up is the delightful It’s the Holidays! 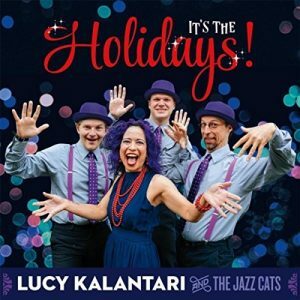 from Brooklyn-based Lucy Kalantari & the Jazz Cats. This collection of five jazz age inspired originals celebrates the holidays between Halloween and New Year’s. The album kicks things off with the clever “My Mommy is a Mummy” (keep this one in mind for Halloween 2018) and is followed by “Grateful,” a rare song about Thanksgiving. This is a lovely tune about family and food, but also about the importance of putting aside our differences and acknowledging those things in life for which we are grateful. Take a listen. Just as the seasons transition from fall to winter, so do the songs on this album. “It’s Snowing” gets listeners thinking about how fun it is to get all bundled up to go outside and of all the exciting things children can do in the snow when they get there. This fast-paced song would work great in winter-themed storytimes as kids dance to the various activities described in the song like stomp, jump, run, slide, and climb. “It’s Snowing” also acts as a nice bridge to the final two songs on the album. The title track, “It’s the Holidays!” is a bouncy celebration of Hanukkah, Christmas, Kwanzaa and a lovely New Year. The refrain, “It’s the holidays in our community/we celebrate all in unity,” encourages listeners to take the time to honor our differences. Finally, the album is capped off with “That’s a Wrap!” a short (1:37 min.) tune that tells listeners “Let’s wrap up this year and say goodbye” and would be a great addition to any New Year’s Eve programs. Looking for some kid friendly holiday songs to share during your family gatherings? Try this compilation of four of Laurie’s videos that are perfect for the holidays- “Candy Cane Jane,” “This Little Light of Mine,” “Jingle Bells” and the Laurie and Brady Rymer duet, “Children Go Where I Send Thee.” Do you have any favorite children’s holiday songs? On Saturday, Sara Lovell debuted this video for her new holiday song, “Wake Up It’s Christmas Time.” If you’re looking for a new tune to share with your kids that seamlessly talks about the excitement of Santa’s arrival as well as the importance of listening to the stories of those who might believe in holidays different than yours, then this song is for you. I love the lyrics toward the end, “And if you family celebrates another holiday, tell me all about it, I’ll come over when you call, We’ll sing the songs you sing and I’ll listen when you tell me what matters to you most of all.” Enjoy this catchy, beautiful song of the season!